Let’s talk about two weeks ago. Monday, October 17th started off as a normal Monday and hinted at a normal week ahead. By Tuesday, though, things were starting to get hectic, and as I ended up staying at work until almost 8pm, I had the sneaking suspicion that the week was not shaping up as I envisioned. Wednesday was one of those interesting days where it was busy, so I still left work late, but the day was really more about watching things unfold for others around me, knowing that when it finally rolled my way, I was going to be slammed. And then Thursday hit. My day started before 8am and didn’t stop until after 11pm. I was juggling several projects and deadlines, watching new work come my way, answering emails and questions, and waiting for others to do their work before I could finish mine. It was never ending. When I finally walked in the door of my condo at midnight, I sat down at the dinner table with my carryout pizza slices and a glass of wine to help wash the craziness away. 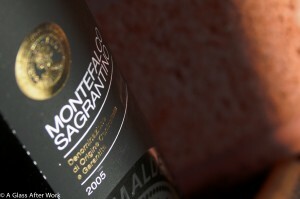 The 2005 Tabarrini Montefalco Sagrantino (winery) was 100% Sagrantino grapes and was a deep inky purple. On the nose, there were dark cherries, blackberries, and tobacco. In the mouth, it felt like the wine was starting to transition from berry-dominated flavors to a more subtle complexity of violets, tobacco, and earth. The wine had big tannins, nice acid, and full body. Is this worth a glass after work? It’s worth more than one! What are you waiting for? At a SRP of $40, this wine may be a little expensive for an everyday buy, but it’s worth every penny. It’s big. It’s bold. It’s food-friendly, but doesn’t require food to be enjoyed. It’s also little unusual, so if you’re looking to shake-up your wine drinking routine, this is a wine worth consider. I’m just sorry that I opened it so late at night and had to wait until the next day to enjoy the rest of the bottle instead of spending the entire evening drinking it because it’s certainly the type of wine that would be perfect for an evening of relaxing with wine.